HAPPY JUNE from us here in sunny southern California! The days are longer, the sun is shining brighter, and the weather is just screaming for (what else?) ICE CREAM! I had had Mateo’s Ice Cream & Fruit Bars bookmarked on my list of places to check out for years, all the way back when we still lived in Palms. Now we live in Del Rey, which is right around the corner from this unassuming strip mall off Sepulveda Boulevard near Lucerne. A flourescent orange length of retail with a giant laundromat anchor, you just can’t miss this spot. Mateo’s is squeezed in all the way in the corner. The storefront is tiny but boasts brightly colored signs depicting fruits both familiar and exotic. It looks and smells like walking into a giant cornucopia, in a good way. The case of ice cream features flavors I’d never seen elsewhere like mamey, smoked milk, and horchata with walnuts. 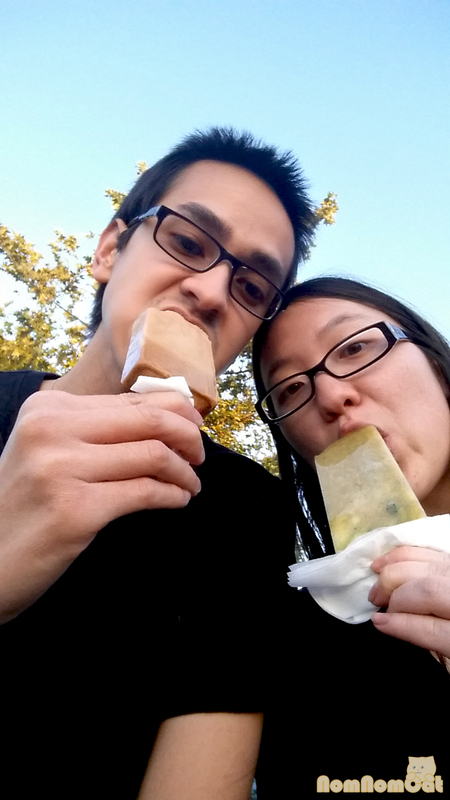 Making our way further into the store, we find the paletas — Latin American fruit-based ice pops (or popsicles). 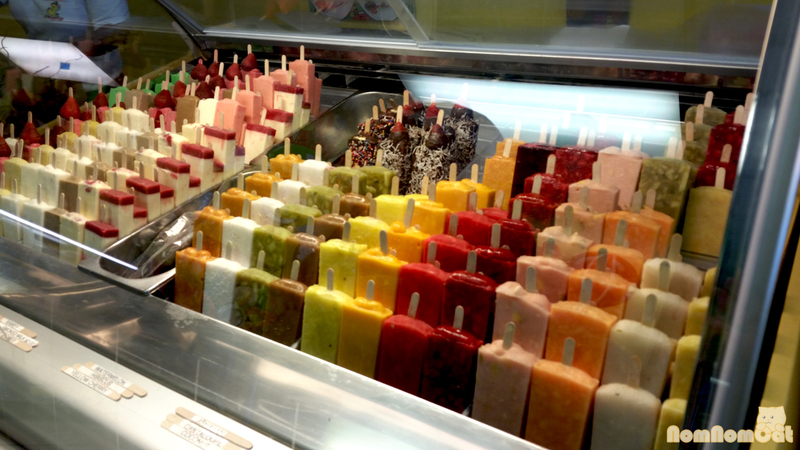 The paletas are arranged in a rainbow, with pink and red strawberry (including a halved strawberry embedded in the middle of the popsicle), golden-colored mango con chile, bright orange-hued cantaloupe, green cucumber con chile, bright alabaster coconut, copper-colored tamarind, and some more sweet-tooth-appeasing creations like chocolate dipped and shaved coconut dusted paletas to finish. It’s an amazing sight, and certainly appetizing on a warm summer day. Best of all? Each paleta is just $2. TWO DOLLARS. An amazing deal especially for the sheer quantity and quality of fresh fruit that goes into making each paleta. They taste like the ripened fresh fruit is pureed, strained, poured into the molds, and frozen. No frills, no additives. On our first visit, I had the cucumber on chile. I love cucumber desserts, and this one was icy and refreshing with just a slightly salty kick from the chile powder. The main part of the paleta was almost too icy, with the high water content of the cucumber itself, but I definitely enjoyed the bits of diced fresh cucumber embedded throughout. Martin had a creamy, coffee-flavored bar that reminded me of a Fudgesicle in texture. Ahh nostalgia… we knew we were going to come back. Sure enough, on our next visit I opted for the mango con chile which I enjoyed even more because of its natural sweetness, the soft chunks of ripe golden mango, and the toothsome texture, much less icy than the cucumber one. The chile powder, reminiscent of the packets sold alongside fresh cut fruit by the street vendors, was just spicy enough to feel a subtle kick. Definitely a summer favorite, I know I’ll be coming back specifically for this paleta over the next few months (and beyond — we all know how beautiful the weather is here year-round). Martin saw the cantaloupe paleta in the display case, one of his all-time favorite fruits and a new addition for the summer season, and just had to have it. He shared only a small nibble, but I could taste how sweet yet refreshing it was. Like a frozen agua fresca, that paleta embodied the purest essence of cantaloupe. It was so freaking good. Our only regret is not giving this place a try sooner, but now that we’re in the know, you can bet we’ll be coming back and telling all of our friends (starting with you dear readers!). Happy summer indeed. Nice to see you are back blogging, sorry I haven’t been around for a while!